Geomagic is one of 3D Systems’ many fine solutions. The company is the originator of 3D printing and has spent more than three decades enabling both professionals and companies to drive new business models, bring innovative products to the market, improve workflows, and optimize designs. Today 3D Systems possess a comprehensive portfolio of technologies that continue to connect their customers with the solutions they require to transform their business via manufacturing innovation. At Willrich Precision Instrument, we carry the latest models pertaining to Geomagic scanners and more. At Willrich Precision, we practice a client-first approach and are highly committed to helping all our customers purchase quality products that can satisfy their scanning needs within budget. 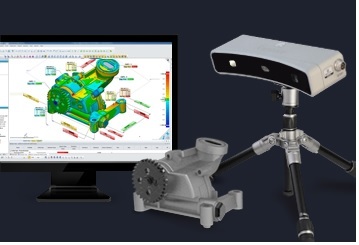 In our Geomagic range, you will be able to find powerful scanner and software systems that enable both engineers and designers to incorporate real-world objects into CAD in a seamless manner. If you are looking to get Geomagic products to improve engineering workflow, you have come to the right place. Our company has been operational and serving the gaging, inspection, and metrology industry since 1971, and with great success. That’s why you can be sure that the products we carry meet or exceed both performance and accuracy requirements of international standards. Start browsing our comprehensive inventory today and shop with confidence!